? Using 8mm thick aluminum alloy plating silver panel, the High Technology wrinkled sheet steel box section, the metal knob.
? Unique electron tubes show that the window after using a warm orange-red lamp.
? High-grade RCA terminal with gold plating, Sturdy output terminal with gold plating, reducing the contact resistance .
? Power supply socket inserted into the three-line, easy upgrading power lines.
? Japan or Taiwan-made W. L potentiometer for volume control,German red polypropylene capacitive coupling via mkp. no sense of Taiwan-made metal film resistor, Vernon Silver Dragon signal line.
? Hypertension using electron tube rectifier, two large reservoirs only ruby filter.
? Adopt no negative feedback circuits form.
? This nice amplifier refer to famous Japan Wada Shigeho's Style improved Electric circuit , having excellent performance. It's sufficient to keep pace with Marantz7.
? 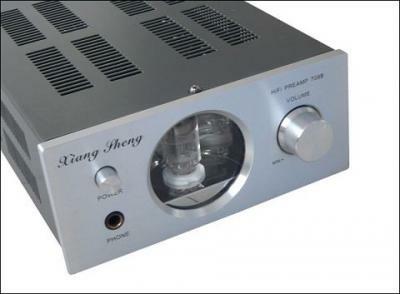 It is not only a pre-amplifier, but also a headphone amplifier. It is your nice choose. Hello!I'm sorry that I can't write to you in Chinese! I hope someone can read this email.I just purchased a 708B preamp/headphone amplifier and I am very happy with the build quality, price and the sound! All are excellent!